Obama Feeding Lebanon to Foe Iran? The Obama administration has quietly asked the United Nations team probing the assassination of Lebanon's former prime minister to put its inquiry on hold so it doesn't disrupt the start of possible Israeli-Syrian negotiations, according to senior Egyptian security sources. That probe was reportedly set to indict members of the Iranian and Syrian-backed Hezbollah organization for the murder of the former Lebanese prime minister, Rafiq Hariri. Just yesterday, Israeli President Shimon Peres announced his country's willingness to enter immediate negotiations with Syria. Syrian President Bashar Assad has stated repeatedly he wants the entire strategic Golan Heights in any deal. The Golan looks down on Israeli population centers and was twice used by Syria to mount ground invasions into Israel. Syria is in an open military and strategic alliance with Iran. "Israel is the product of pioneering human spirit," stated Peres yesterday, speaking at the United Nation's Millennium Development Goals summit in New York. "In spite of wars, we made peace with Egypt and Jordan," said Peres. "[And now] we are ready to enter direct negotiations with Syria. Right away," said Peres. In the same speech, the Israeli president slammed Syria's partner, Iran, for its leadership's declarations to "annihilate Israel." 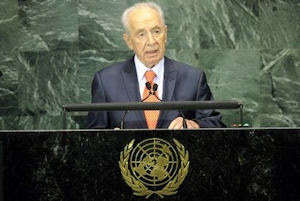 Peres held a press conference following his speech in which he called Iranian President Mahmoud Ahmadinejad a "living declaration against the U.N. charter." He called on the U.N. to reassess whether Iran should be allowed to be a member. The U.N. tribunal investigating Hariri's assassination has been asked by the White House to hold off for now, according to Egyptian security officials. The officials said the Obama administration does not want the probe to interfere with the start of any Israeli-Syrian talks. In July, Hezbollah Secretary General Hassan Nasrallah said he had been informed the tribunal was set to implicate a number of his group's members. But with the U.S. and international community seemingly unengaged with the tribunal and with U.S. support for the pro-Democratic forces in Lebanon nearly nonexistent, the country's traditional pro-Western leaders have been switching allegiances to the Iranian and Syrian axis. Last Month, Prime Minister Saad Hariri, son of Rafiq Hariri, announced to the public he had been wrong to blame Syria for his father's death. Hariri is set to visit Damascus for a second time this month. "At some point, we made a mistake," Hariri declared. "At one stage, we accused Syria of assassinating the martyred premier. That was a political accusation, and that political accusation is over." Also, Druze leader Walid Jumblatt, previously one of the most vocal critics of Hezbollah and Syria, has also publicly changed his tune, visiting Syria and declaring the country an ally. Any Israeli negotiations with Syria would aim to give some or all of the Golan Heights to Damascus. Even when Syria shortly held the Golan, some of it was stolen from Jews. Tens of thousands of acres of farmland on the Golan were purchased by Jews as far back as the late 19th century. The Turks of the Ottoman Empire kicked out some Jews around the turn of the 20th century. The online Jewish Virtual Library has an account of how in the late sixth and fifth centuries B.C., the Golan was settled by Jewish exiles returning from Babylonia, or modern day Iraq. In the mid-second century B.C., Judah Maccabee's grandnephew, the Hasmonean King Alexander Jannai, added the Golan Heights to his kingdom.